After breakfast, I would go for a walk down Rambla de Catalunya and soak up the ambience, rummaging through the shops and small boutiques of L’Eixample. 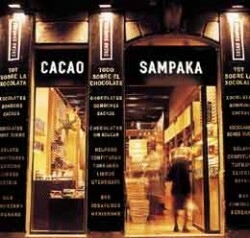 If one works up a thirst, then the chocolate shop, Cacao Sampaka (c/ Consell de Cent, 292), is the ideal place. With chocolate from all over the world, the smell is overwhelming. There is a little café at the back of the shop which serves up the best hot chocolate I’ve ever tasted. Try the dark hot chocolate. It’s delightful. As the morning progresses, I would take a walk down towards the port and go for a drink by the beach and soak up the sun and atmosphere of the beach. Then for lunch I would head to El Refugio del Puerto (c/ Judici, 4), to have some arroz caldoso. They do the most amazing arroz caldoso, even if the surroundings of the restaurant aren’t up to much! After lunch, I would take a walk up to the Parc de la Ciutadella and have a siesta under one of the trees, relax and watch the world go by. It’s an enchanting place where you forget that you are in the centre of Barcelona! A pre-dinner drink always forms part of a perfect day, and I would head to my favourite wine bar in Barcelona, Espai Clos Mont Blanc (c/ Pau Claris, 169). Alberto and Ivette take great care of all of their customers and I would have a nice cold glass of their Xipella wine. They also serve some tapas too and I highly recommend their martini olives! To end this perfect day, I would venture 20 minutes out of the city to the town of Viladecans. This is a residential town with around 64,000 inhabitants. It may sound surprising but there is a wonderful beach in Viladecans which makes up the Delta de Llobregat, a protected nature reserve. It’s amazing to think that this protected area is only 20 minutes from Plaça de Catalunya. You would think you are in another world! It’s vital to have a walk along the beach between Viladecans and El Prat, so tranquil with very few people. Once the daily exercise has been completed, an appetite has been worked up and there is a restaurant which is a hidden gem in Viladecans. It is called Suc (c/ San Joan, 10) and I call it my Michelin star restaurant without the Michelin star. It’s a fantastic restaurant run by Josep Badrinas and Veronica Aguilera. Veronica is the maître, however was a chef in the past and Josep is in charge of the kitchen. The restaurant has the option of a tasting menu or à la carte, however whatever you choose, you will not be disappointed! 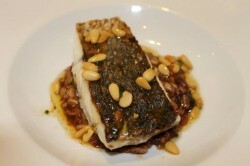 The cuisine is modern, using fresh market ingredients with Catalan influences. The restaurant offers wine tasting sessions on a regular basis with sommelier’s from different catalan bodegas, ranging from Penedes to Costers del Segre. After dinner, a nightcap is a must and although Viladecans is small, there are some great bars to round-up the evening. 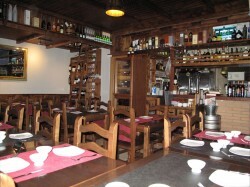 Taberna Foxos (Avda. Segle XXI 45-47), is a Galician taverna which serves the most wonderful gin and tonics. With over 50 gins in stock, there is something for all tastes. From the way that they prepare the drinks to the taste, their gin and tonics are spectacular, especially the gin mare which they prepare by burning dried out rosemary. Helen is a Barcelona based British Baker who has lived in the city for over 5 years and shares her passion of baking with those in the city. Originally from Glasgow, Scotland she is a self-taught baker and has been baking for over 20 years. She runs baking classes in both Spanish and English in various locations throughout Barcelona. You can check out her sweet delights on her blog, The Diary of a Cake Maker and on her Facebook page. You can also follow Helen on Twitter at @diarycakemaker. Thanks for some out of town recommendations Helen. I love the protected area to have an afternoon cycling so great to know of some places to stop off for re-fuelling and refreshments.